The PUREX extraction in nuclear fuel reprocessing leaves behind a nitric acid raffinate full of (mainly) 'fission products', which are a diverse set of elements produced by fission in a nuclear reactor. The concentrations of the various components of the raffinate are shown in this image. My goal is to separate out the group III elements from the group IV+ elements (shown highlighted in red/blue). It does not matter what happens to the rest of the components, they can go with either or neither of these groups in any combination, all that matters is that the group III elements are spatially separated from the group IV+ elements. The process can be as inexact as necessary as long as it mostly accomplishes this goal. Any thoughts? My nuclear chemistry book says that these group III elements are "have soluble nitrates, chlorides, and sulfates while their fluorides and hydroxides are insoluble. LaF3 is frequently used as a carrier for this group. They form stable complexes with strong chelating agents such as DPTA, EDTA, and the like". Perhaps this makes the question fairly straightforward, I'm coming from a physics, not a chemistry background. I'm just confused as to what properties the group III elements have that the group IV+ elements don't which could be leveraged to achieve some kind of separation. Sorry for the wall of info, and thanks very much in advance for any help or input! You have chosen a difficult challenge, a word of advice unless you are working in a nuclear site I would advise you in the strongest terms possible not to attempt a separation of radioactive things in your kitchen, basement, garden shed or some other home lab. OK warning over, now the idea of adding flouride to create a percipitate of lanthanide (and post plutonium actinides) is a nice idea but it will make any further processing of these elements harder. 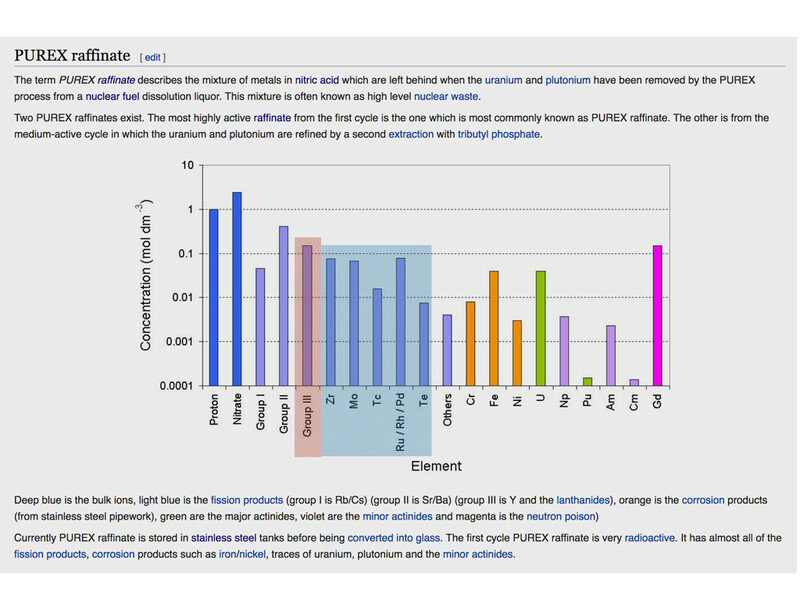 I also worry that any traces of plutonium or other elements such as zirconium might become incorperated into the lanthanide flouride perceipitate. I would suggest that you consider solvent extraction as the separation method, I would suggest that you consider the TRPO process chemistry from China. If you were to dilute the PUREX raffinate to reduce the nitric acid content to about 0.5 M, then shake the PUREX raffinate with about 30 % (v/v) of cyanex 923 in an aliphatic kerosene then you will have a organic solution which is a mixture of lanthanides, zirconium, iron and residual plutonium / uranium. I would suggest stripping (back extracting) the organic phase with strong nitric acid, the plutonium, uranium and zirconium will stay in the organic phase while the lanthanides will go back into the aqueous phase. In some ways a better alternative would be to use TODGA or a malonamide, a solution of one of these reagents in aliphaltic kerosene will extract the lanthanides from PUREX raffiniate without adjustment of the nitric acid content of the raffinate. You can then strip the lanthanides (plus the americium / curium) from the raffinate. These types of processes have been tested at ITU in their hot cells using PUREX raffinate formed from real fuel. In some ways I would want to use dilute nitric acid as a stripping agent for the lanthanides from a diamide based process. You can then reextract the lanthanides from the dilute nitric acid with 30 % DEHPA (bis-2-ethylhexyl hydrogen phosphate) in kerosene. In turn back extract this new organic phase with nitric acid, if you are careful it is possible to get some separation of the lanthanides into the heavy and light lanthanides by selective stripping with different concentrations of nitric acid. Another method which would work would be to use the TRUEX process chemistry from the USA, this is based on CMPO in tributyl phoshate modified kerosene. Not the answer you're looking for? Browse other questions tagged organic-chemistry inorganic-chemistry nuclear-chemistry separation-techniques or ask your own question. What is the reason behind choosing the specific elements used for the synthesis of heavier elements?